1. This Country Partnership Strategy Progress Report (CPSPR) assesses progress in implementing the FY07-10 Country Partnership Strategy (CPS) for the former Yugoslav Republic of Macedonia (fYR Macedonia), which was discussed by the Board of Executive Directors on March 27, 2007.’ The CPSPR confirms the overall direction of the World Bank Group program while introducing adjustments to the evolving partnership through the remainder of the CPS period, including the introduction of a streamlined CPS results framework. 2. A new Government took office in August 2008 supported by a strong coalition but facing setbacks on integration with the North Atlantic Treaty Organization (NATO) and the European Union (EU). The new governing coalition holds more than two-thirds of the seats in Parliament and includes the so-called “Badinter” majority, which i s required for legislation that has significant implications for ethnic minorities. 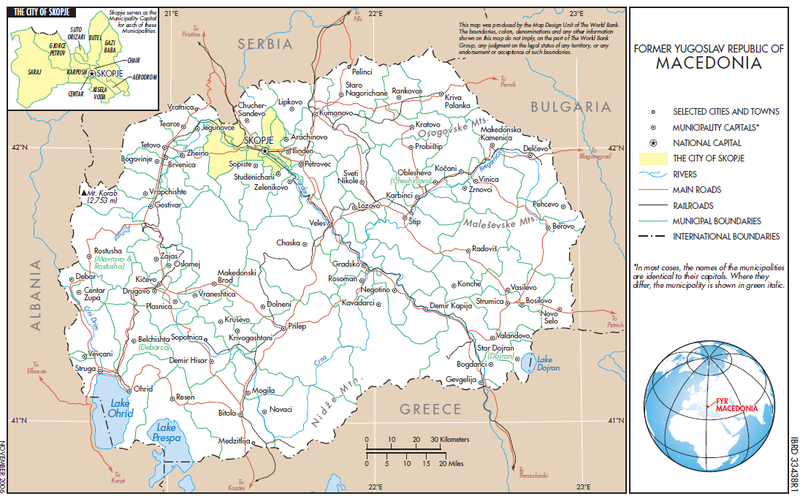 The snap elections leading to the new Government were organized following the April 2008 decision by NATO to not extend membership to fYR Macedonia. This decision represented a major disappointment, especially as NATO invited Croatia and Albania to join. NATO made clear that an invitation to fYR Macedonia will be extended as soon as a mutually acceptable solution to the dispute over the country’s name i s reached with Greece. Resolution of this long-standing UN-mediated dispute would also have important implications on fYR Macedonia’s aims to launch negotiations for EU membership, for which the country achieved candidate status in December 2005. These aims, however, suffered a further setback as observers from the Organization for Security and Cooperation in Europe reported that international standards were not met in the conduct of the June 2008 parliamentary elections. The conduct of the presidential and municipal elections scheduled in March 2009 will be critically important. 3. In November 2008, the European Commission noted in its annual Progress Report some headway toward EU standards, particularly on economic criteria, but insufficient advances on political criteria. Given relatively l i t t l e progress on the political front, which i s reflected in the lack of constructive political dialogue and the need for further strengthening of the judiciary, the Report did not recommend a date for the start of EU accession negotiations. EU membership enjoys the overwhelming support of the population, and remains a key government goal and a driving force of the government program. 4. Economic growth until recently accelerated fueled by continued structural reforms and prudent macroeconomic policies (see Table 1). Real GDP growth averaged 5.6 percent in 2007 and 2008. The investment to GDP ratio began to rise, and fYR Macedonia increasing Foreign Direct Investment (FDI). Job creation trends turned positive employment rate rose from 39 percent in early 2006 to 42 percent in mid-2008, attracted and the although unemployment remained very high. Credit growth peaked at 40 percent in April 20OSy2 and the ratio of private credit to GDP doubled from 20 percent in 2003 to’more than 43 percent in 2008. Unlike several countries in the region, fYR Macedonia’s credit growth has been driven by deposit growth, not capital inflows. Despite rapidly declining prospects for growth in 2009 due to the global economic downturn, fYR Macedonia needs to build on its recent success and sustain higher growth rates over the longer run to significantly reduce poverty, which remained stubbornly high at about 19 percent from 2002 to 2006. 5. The Government’s structural reform program focused on improving the investment climate through regulatory reform, liberalization of the banking and telecommunications sectors, and anti-corruption activities. 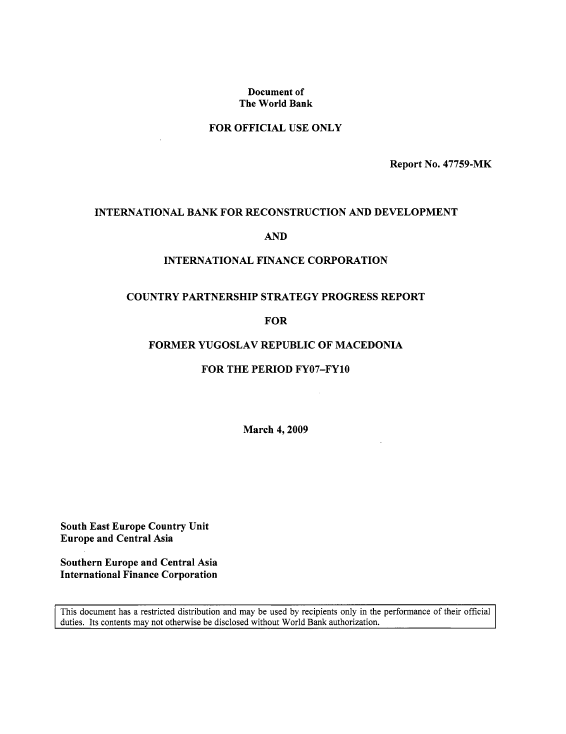 Testament to the brisk pace of reform was fYR Macedonia’s fourth place ranking in the 2008 Doing Business Index of Top reformer^.^ Progress was also made in tackling corruption: fYR Macedonia improved its ranking in the Transparency International Corruption Index from 105 in 2006 to 72 in 2008. 6. Monetary policies were tightened in 2008. After relatively loose monetary policies in 2006 and 2007, the Central Bank raised its intervention interest rate from 5 percent in 2007 to 7 percent in 2008. The Central Bank also introduced additional reserve requirements to slow the pace of credit growth and help maintain parity with the Euro while limiting inflation threats from external commodity price shocks. Credit growth eased to 34 percent in December 2008. The banking system remains healthy and, according to the 2008 Update of the Financial Sector Assessment Program (FSAP), i s sufficiently capitalized to withstand a range of shocks. About 55 percent of the stock of private sector credit i s either denominated in foreign currency or indexed to foreign currency. This ratio has been stable for several years as has the ratio of foreign currency deposits to total deposits, at about 50 percent. However, the recent Article IV consultation of the International Monetary Fund (IMF) concluded that additional steps are needed to control credit expansion. 7. Fiscal policy turned sharply expansionary in late 2008 after several years of fiscal prudence. The Government ran surpluses in most years since 2003, and gross public debt was cut in half from more than 40 percent of GDP in the early 2000s to about 20 percent in mid-2005 However, in the last quarter of 2008, the budget deteriorated from a surplus of 3 percent of GDP to a deficit of about 1 percent of GDP. Some of this surge in expenditure represented transfers to budget entities in the last weeks of the year. The fiscal stimulus of these transfers will be felt in 2009 when these entities spend the funds. In December, Parliament adopted a 2009 budget which envisages a further fiscal expansion and a deficit of 2.8 percent of GDP. 8. The recent fiscal expansion raises concerns given the rapidly deteriorating current account deficit and the historic global financial crisis and economic downturn. Rising energy and food prices in the first half of 2008 represented a terms of trade shock, which, together with high imports of investment goods, contributed to widening the current account deficit from 4.4 percent o f GDP in 2007 to 13.2 percent in 20OtL6 This deficit was financed in part by FDI, which reached 6.8 percent of GDP in 2008. However, FDI dropped sharply in the fourth quarter o f 2008 and by end-2008 reserves began to fall. Prospects for exports (heavily concentrated in metals and textiles), FDI, and private transfers are exceptionally poor in 2009. Metal exports have already been hard hit. 9. Given fYR Macedonia’s growing economic vulnerabilities, caution is warranted in fiscal policy in 2009. FYR Macedonia’s fixed exchange rate has served the economy well and the Government has noted its commitment to this regime. 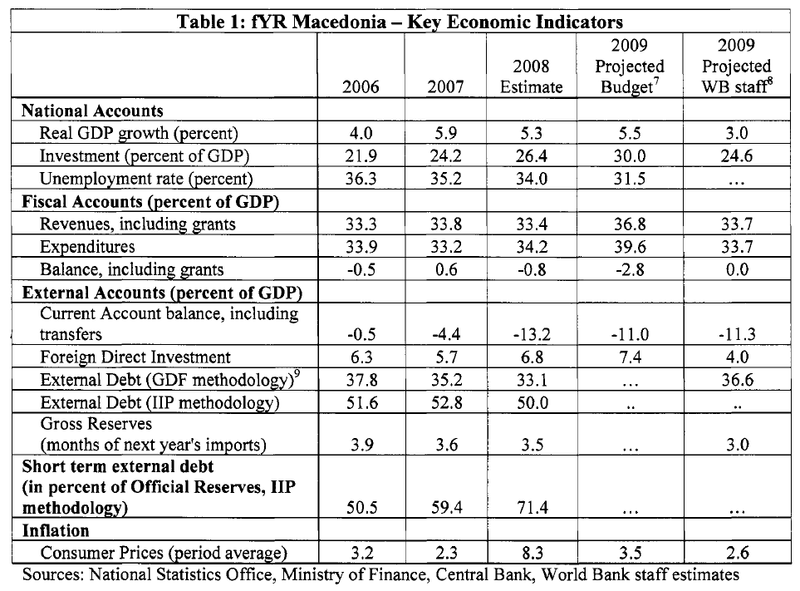 The Government’s macroeconomic projections prepared in late 2008 and approved by the Parliament as part o f the budget in December 2009 are presented in Table 1 (see column labeled “2009 Projected Budget”). More recent projections by the World Bank, presented in the final column o f Table 1, take into account the deteriorating global conditions. This challenging external environment calls for a more prudent fiscal policy, which would require a revision o f the 2009 budget and reflect the Government‘s commitment to support the exchange rate regime. A failure to sufficiently tighten fiscal policy would likely stimulate domestic demand and worsen the current account deficit, which could lead to falling reserves and pressure on the exchange rate. To offset the expenditure surge from late 2008, the Government could also slow the execution o f budgeted capital expenditures to contain the budget deficit before adopting a supplementary budget. In the current environment, protecting transfers to the poor i s also critically important.